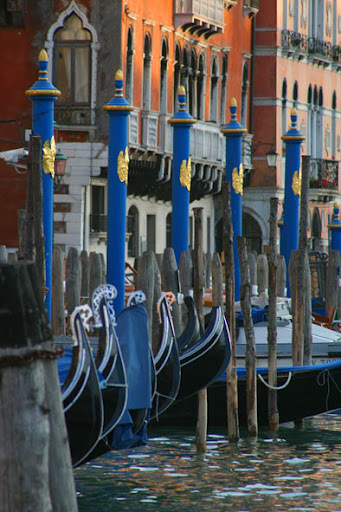 Blue poles…and not by Pollack! 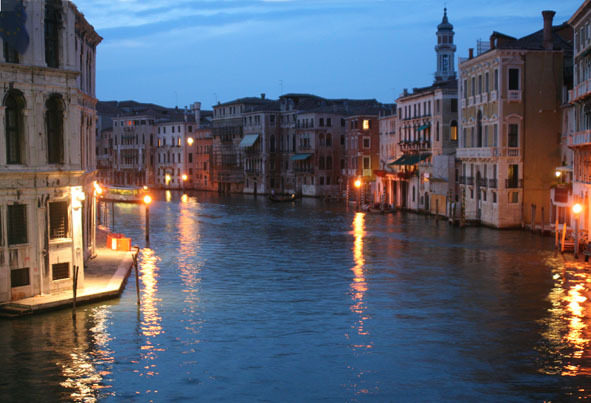 Venice is even more gorgeous than all the photos, films and stories would suggest. 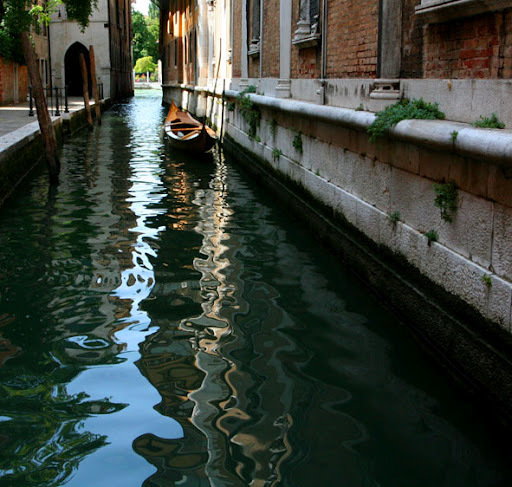 The water in the canals is cleaner and bluer than expected and there is no foul smell at all (and the whole city is cleaner than we have found other Italian cities to be). Eating out there, however, is very expensive so the flash dinners have been kept to a bare minimum! 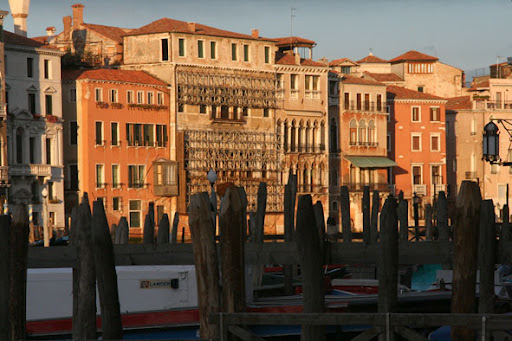 Our little studio apartment was in the Castello district to the east of San Marco. It had no view, a sofa bed and was very tiny, but there were no stairs, so that was a big bonus. We were able to cook some pretty fabulous meals there for ourselves, so that made us both happy. Not a very touristy part of town, which is always a plus, but we were close enough to all the sights. On our first night we arrived so late that we went to our local take-away pizza joint and grabbed a very tasty ‘lucifero’ with a bottle of beer and we were set! Our first day was spent exploring and buying our various museum and church passes to enable smart line jumping and money saving. 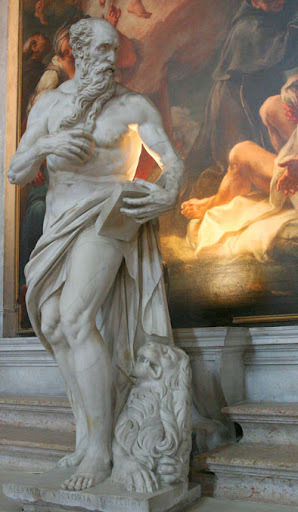 We leapt right in there by visiting the Frari Church (not an obvious first, but it was close to where we were at the time) which is filled with some pretty amazing paintings and statues by Titian. Was a pleasure to see the art in situ and not stripped of its original location and put in a museum. 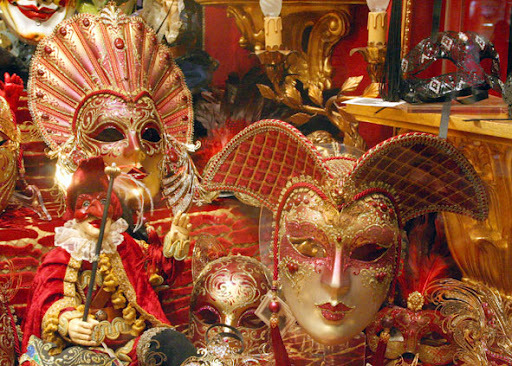 This was followed by a visit to the museum of 18th Century Venice – Ca’ Rezzonico. All very Casanova. 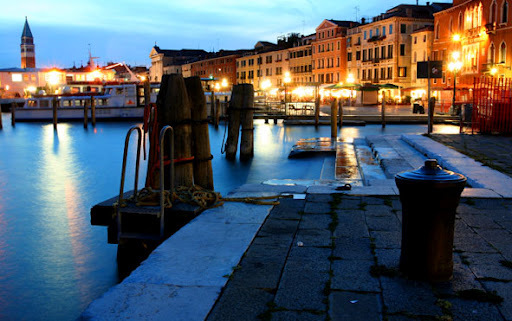 We treated ourselves to a very romantic canalside dinner at a place called Trattoria da Giorgio ai Greci. We chose our seabass from the iced display case and they baked it for two and brought it out on a huge platter with potatoes, tomatoes, olives and drizzled in a wonderful herb, butter and wine sauce. They filleted it in front of us with panache and served it with a flourish. 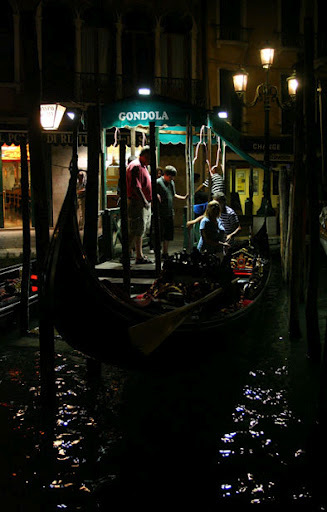 A bottle of dry white wine was the perfect accompaniment, as was the fading light and the gondolas gliding past. 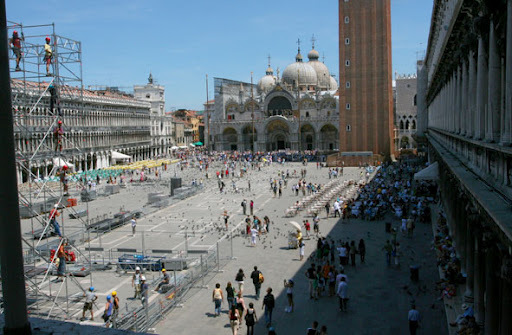 Finished off the meal with chocolate and coffee desserts and then wandered around San Marco square for the evening, pausing to sit and look and laugh at people doing their thing with the flocks of pigeons – some avoiding, some enticing with food, but all very entertaining to watch. Finally made our way back to the apartment and watched Erin Brockovich in Italian. 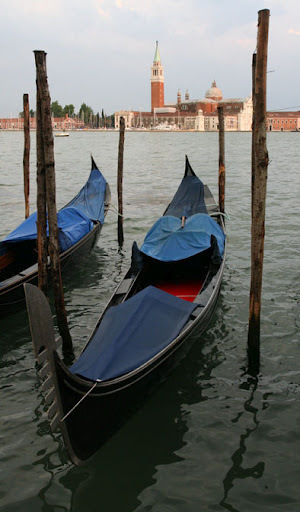 We used a couple of tricks shared in our Rick Steve’s guidebook and headed to San Marco Basilica on our second morning. We went straight to the bag check place, a building or two away and then took our bag check card to the front of the very long line and went straight in. Because so many people get to the front of the line and find out they have to check their bags in another place, they don’t make them line up again, so we just skipped the whole lining up part! Very happy about that! 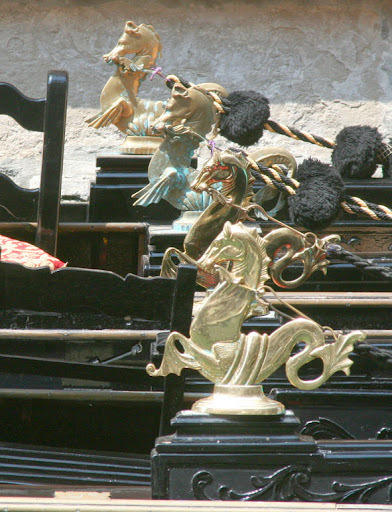 San Marco’s is a very big highlight of Venice. The unusual architectural combinations in the one building are sumptuous and exotic and a little strange, but it so works! 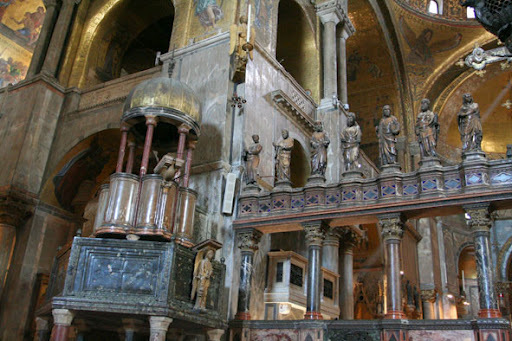 The golden mosaics on the outside are impressive enough, but that is nothing compared to the interior. Upon entering one is struck dumb, mouths hanging slack-jawed at the roof (a football field in area) which is covered in the most exquisite gold and brightly coloured tiny mosaic tiles. So very, very beautiful, and so dramatic – such bling! From San Marco’s we popped next door to the Doge’s Palace, which had its own special magnificence. We also walked straight past the long line because we had a museum pass and all the other suckers were too miserable to fork out for more than one museum at a time. It so paid off in time and discomfort – especially when all the places of interest are much cooler inside than standing in line in the heat (although it has only been about 29 degrees – hope we aren’t rubbing it in for those of you suffering winter in Oz!). 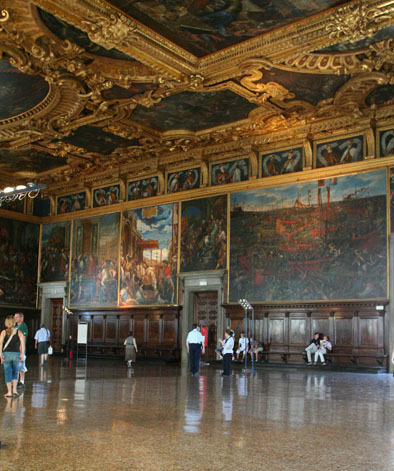 One of the highlights of the Doge’s Palace was a Tintoretto painting called ‘Paradise’ (dubbed ‘The Monsterpiece’) – the largest oil painting in the world in the Grand Council Hall. This painting had 500 people in it, well, 501 – the day that Tintoretto finished his masterpiece, his daughter died, so he grabbed his brush and added another figure, saint number 501, a beautiful young woman in blue in the centre ascending to heaven. Truly amazing to behold. The Grand Staircase in the courtyard and the Golden Staircase (with its 24-karat gold ceiling) in the main entrance were also highlights. As were the prisons, over the canal from the Doge’s Palace and connected by the ‘Bridge of Sighs’ (included as part of our tour). The original prisons were in the bowels of the Palace, but eventually they just weren’t big enough to hold all the miscreants in Venice. The Palace had a ‘Mouth of Truth’ where anyone could anonymously put your name on a piece of paper and deposit it in the ‘Mouth of Truth’ and you could be arrested and “questioned” and disposed of with no real trial by the ‘Council of Ten’ (the terrifying Renaissance version of the CIA…or maybe KGB). All very nasty. 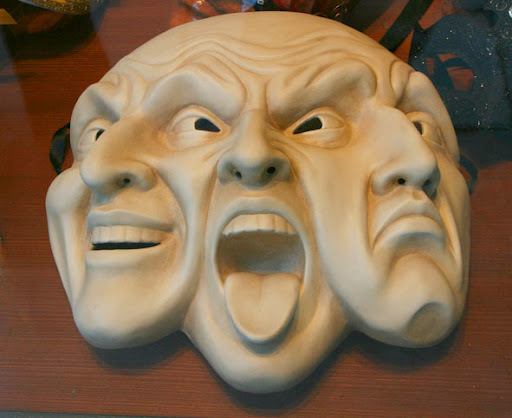 Of course, most of us know of the ‘Mouth of Truth’ from the film Roman Holiday (Gregory Peck, Audrey Hepburn), but this one is different – or so the guide books tell us. 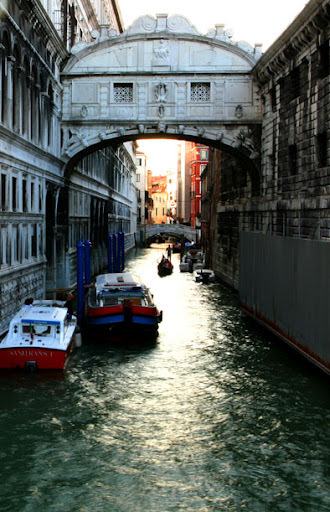 The ‘Bridge of Sighs’ was a covered bridge where prisoners were taken from the presence of their ‘judges’, over the canal, for imprisonment, torture or death (or all three). 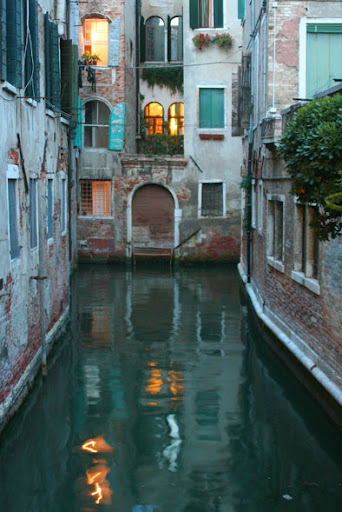 Supposedly they were given a last glimpse of Venice through the bars of the tiny windows of the bridge and they, of course, sighed at her beauty and their loss at never being free again. Sounds like a whole lot of bollocky propaganda! 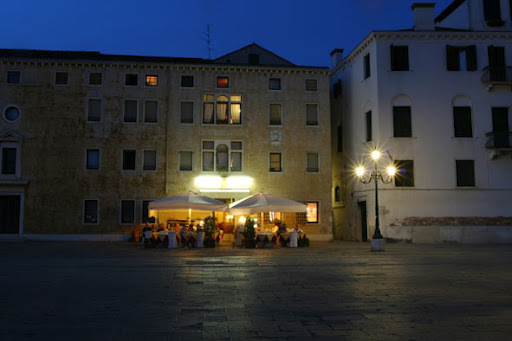 The Correr Museum, at the opposite end of San Marco Square, was given a very brief once over as we were starting to flag and were in desperate need of some food and a good lie down. The food problem was solved with some yummy packed sandwiches and our rushed tour meant we were back in the apartment in time for a sleep by 3:30pm (perfect timing, really). Nic cooked a scrummy dinner after being let loose in the big supermarket a couple of canals away (the way to combat the exorbitant cost of meals in Venice is to do some cooking!). Afterwards, fuelled with garlicky pasta followed by gelati, we had the energy to explore new areas of the island and take more photos in the twilight. 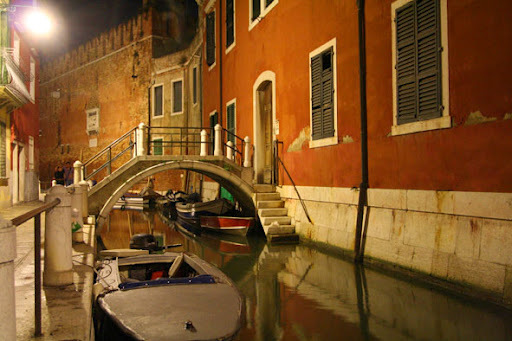 This became a regular afterdinner treat – strolling the alleyways of the city and marvelling at its old and decaying, yet still beautiful and oh so romantic, facades and canals. 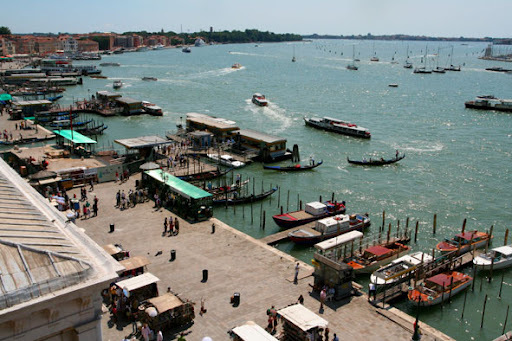 Hit another 3 major sights on our third day – the Accademia, the Peggy Guggenheim Collection and La Salute Church. 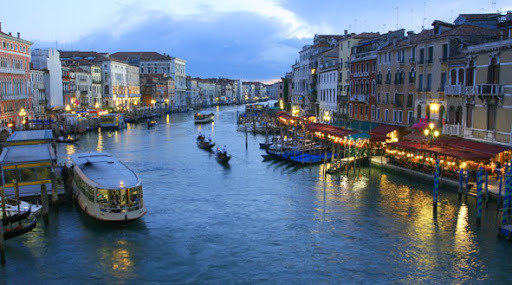 All are on the other side of the Grand Canal from where we were staying so we walked across the Accademia Bridge (one of the three places to cross the Grand Canal on foot – all other methods involve boats). 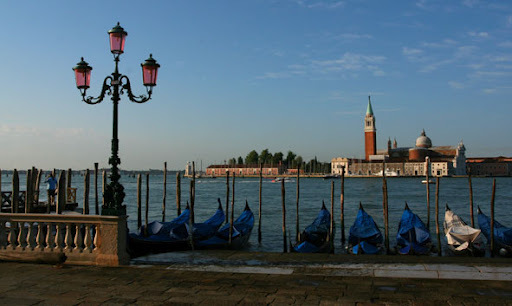 It is also one of the most popular spots to photograph La Salute, but both the Bridge and La Salute are covered in scaffolding, so neither made great photo subjects. Shame, but still lovely. The Accademia houses oodles of Venetian Renaissance masters (from early Renaissance to high Renaissance) and stars Titian, Venorese, Tintoretto, Bellini, and Giorgione with some Canalettos thrown in. 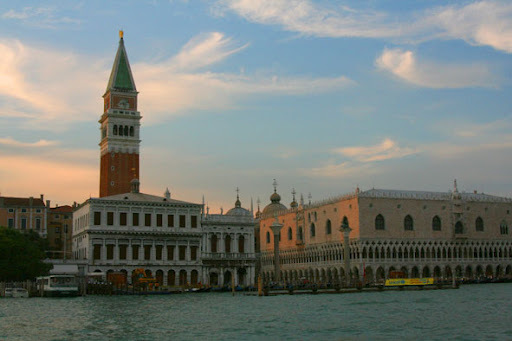 The scale of most of the paintings from the Venetian Renaissance was huge. Combined with the bright colours and ‘slice of life’ subjects (with a bit of religion thrown in), they were very impressive pieces. 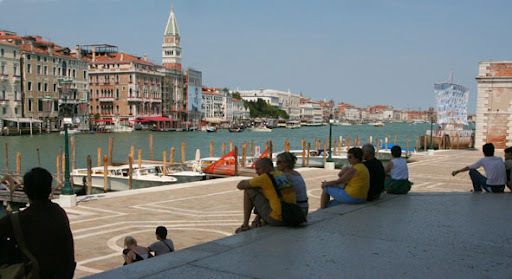 Browsing through art galleries can be very tiring, so a refuel pit stop was necessary sitting in umbrella shade with beer and pizza watching the vaporetto (the ferries), water taxis and gondole drift past. Full and sated, we made our way to the Peggy Guggenheim Collection. The collection was basically a “who’s who” of the trail-blazers of modern art of the 20th Century. The woman herself was pretty damned amazing too with her passion for art (and artists!) 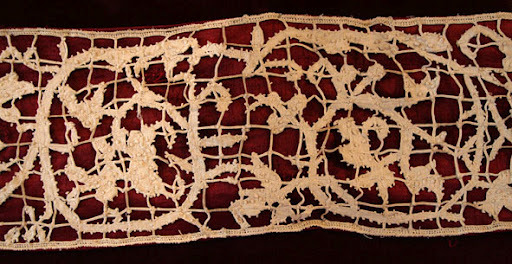 and her determination for the shocking and innovative work to be seen, often before the world was ready for it. Very interested in finding out more about her. 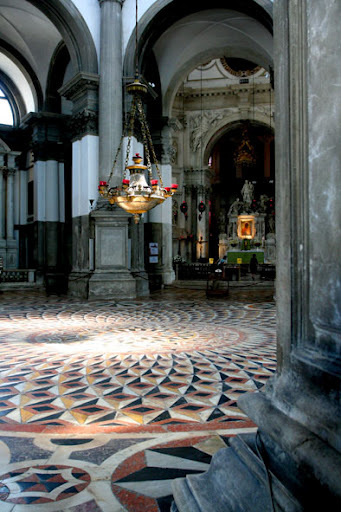 Strolled to La Salute Church to wow once more at the beauty of religious architecture. 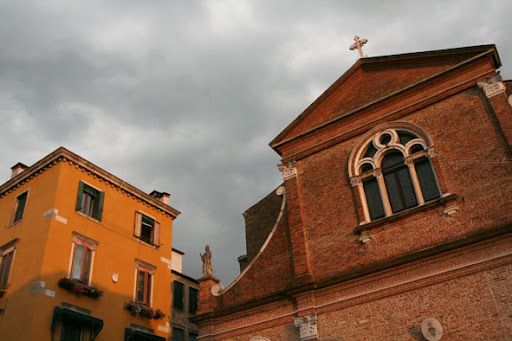 This church was built by the city wanting to thank the Virgin Mary for allowing only 1 in 3 Venetians to die during the plague of 1630. 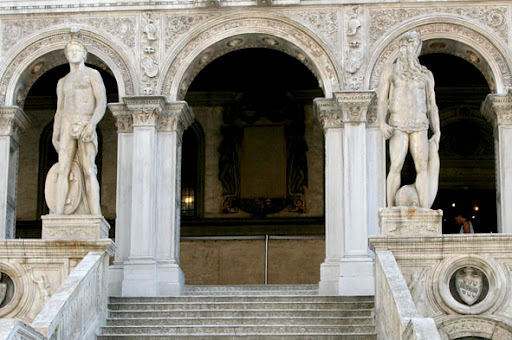 It is filled with paintings and statues by the ‘biggies’ of Venetian art, in fact, it’s also covered in statues (125 of them!) so it is pretty lush – such a shame the dome is covered in the dreaded scaffolding (present in every city we have visited, marring the appearance of some gorgeous thing or other we travelled thousands of kilometres to see). 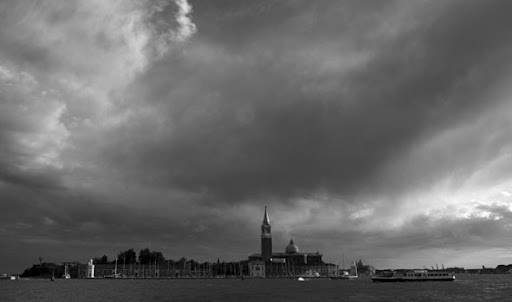 Finished the day with a walk to San Marco and sat watching the San Giorgio Maggiore across the Grand Canal as the sun faded and the duelling orchestras volleyed to each other across the square. 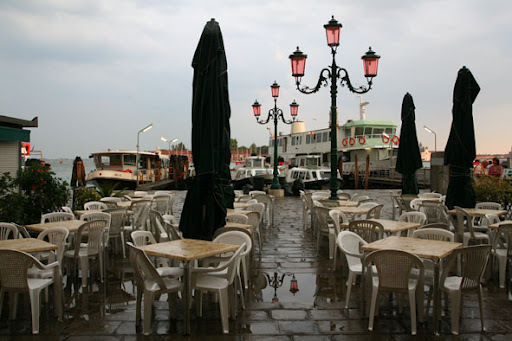 The one time of day when some of the cafes are closed but their tables and chairs are still there for tired tourist legs to rest. 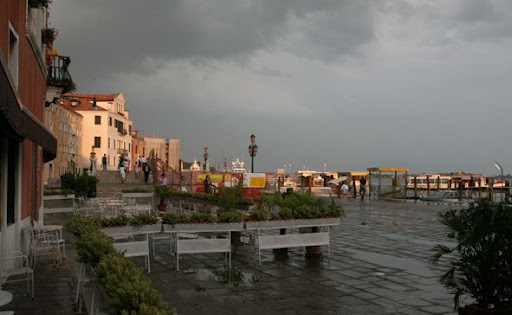 Took a boat to the islands of Burano and Murano on Day 4. 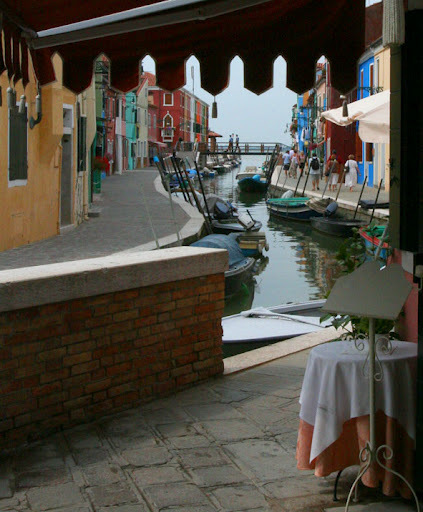 Burano is the home of lace making and Murano the home of glass blowing. 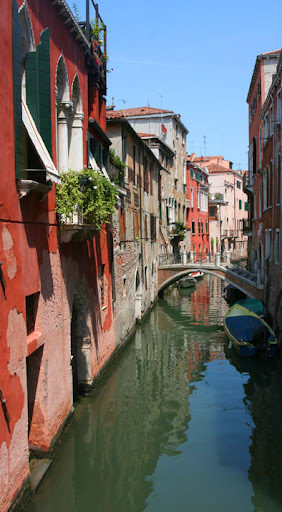 Both islands were smaller and sweeter tastes of Venice, little villages in fact. 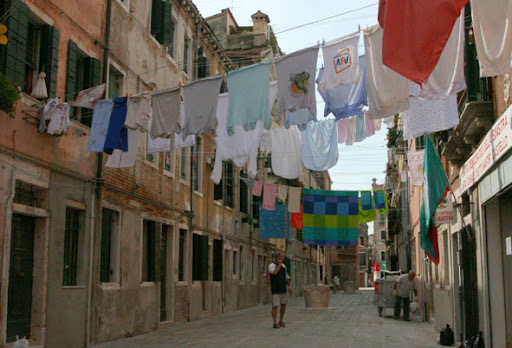 Burano was particularly nice – very colourful houses in vibrant greens, blues, purples, reds, oranges and even hot pink. 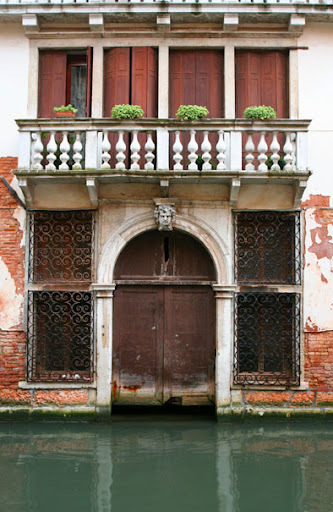 The buildings also lacked the flaking plaster and paint of Venezia. Very pretty indeed. 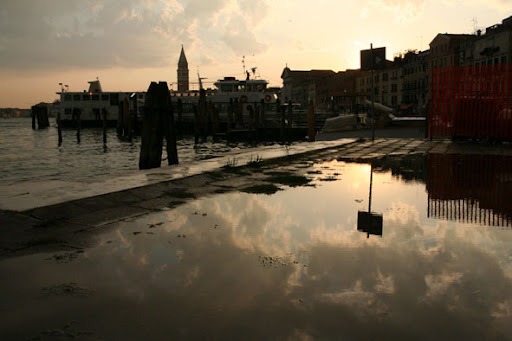 A particular joy for both of us was the thunderstorm in the evening (experienced from the safety of indoors) which we immediately followed with a stroll along the main shore front of the lagoon with very few people, lots of puddles, fabulous sunset and cooler temperatures. Absolutely delightful! 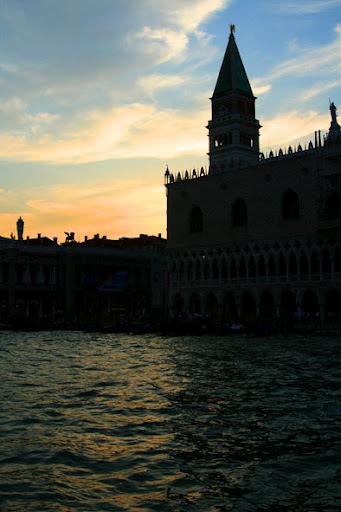 Having covered pretty much all of the ‘must-sees’ of lovely Venezia, by the fifth day we were able to take our time and just explore wherever we fancied. 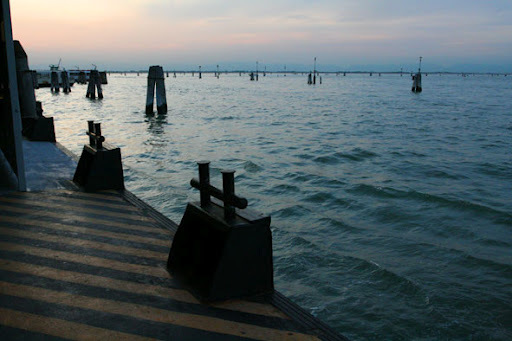 We took the opportunity to check out the areas east of San Marco which included this year’s Biennale exhibition. Some interesting and exciting pieces, but also a certain amount of drivel and self-indulgence. Quite liked the Australian contribution (even liked the pavilion housing the Aussie stuff – very corrugated iron, hardwood and stainless steel tension wire – Aussie, Aussie, Aussie, oi, oi, oi!). 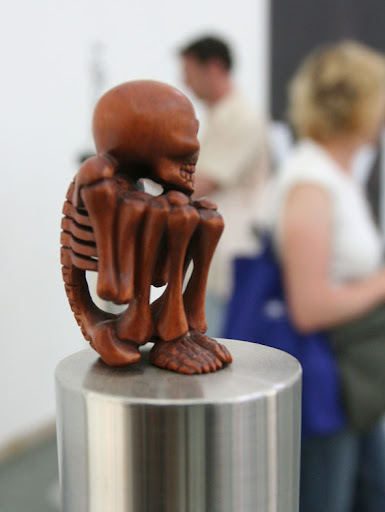 A particular favourite was the French contingent – Sophie Calle. Her work was the response of 107 women (through dance, photography, film, mime…whatever) to a ‘break-up’ email that the artist received from a lover. Very compelling. Miranda Richardson reading the email on film was a particular highlight for Nic. 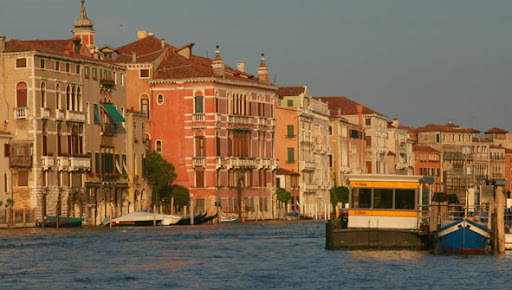 After lunch, more trips on the vaporetto to some previously unvisited churches and then some exploration (and battle with day-tourist crowds) walking from San Marco to Rialto then crossing the Grand Canal for further strolls away from the hordes. Shared a bottle of wine in our little studio flat with some home-cooked pasta leftovers and fresh caprese salad. Joined the locals for the evening outdoors, the sounds of kids kicking soccer balls, loud conversation and laughter around every corner and in every campo. Our final full day began with a lovely sleep in followed by more Biennale time (there are two ‘gallery’ locations – one at the gardens, the other in the arsenal). Second day of modern art was much more enjoyable. Another two exhibits by Australians who did us proud with their creativity and messages. 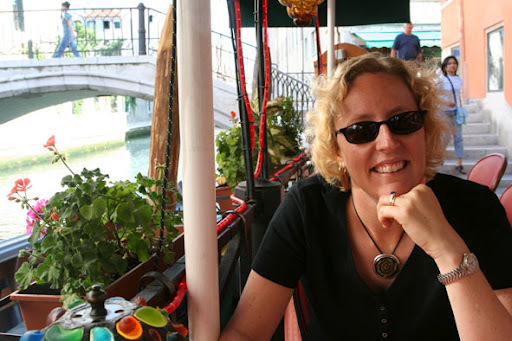 Our final lunch in Venezia was at Ristorante San Giorgio in our own little suburb on the waterfront of the lagoon. Finally tried the aperitif of a Bellini (champagne and peach juice) which was a little too sweet, both still prefer champagne straight. Our meal consisted of fried shrimp and calamari with polenta and salad, and a Venetian specialty of veal liver and onions, also with polenta, with a half carafe of house white wine, of course. 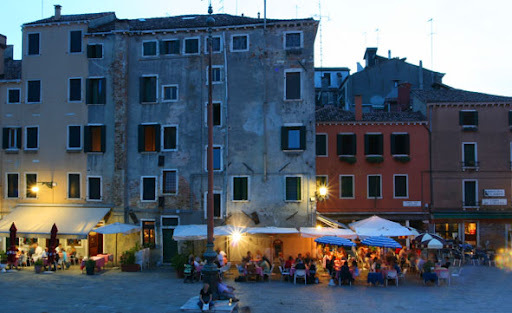 Very tasty, very relaxing and so very enjoyable for a ‘last-meal-in-Venice’. 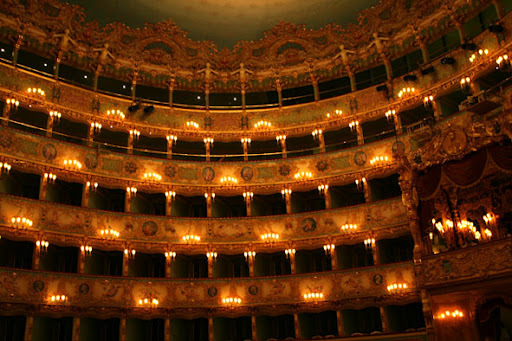 In the afternoon we had the chance to visit and tour La Fenice – the Venice Opera House. It’s name, the Phoenix, is rather appropriate considering it has burnt down and been rebuilt three times in its history. What exists now (rebuilt after the 1996 fire) is a beautiful reconstruction of the original design – with some fantastic modern adjustments, such as individual air vents under every seat in the auditorium to enable the airconditioning to be so finely tuned so as to run completely silently and not disturb patrons, musicians or performers. It had a fabulous elevator orchestra pit floor that could actually be raised to the floor level of the auditorium for more seating or raised even higher to the level of the stage. Such modern innovation combined with the lush architecture of the original design made it such a gorgeous theatre. 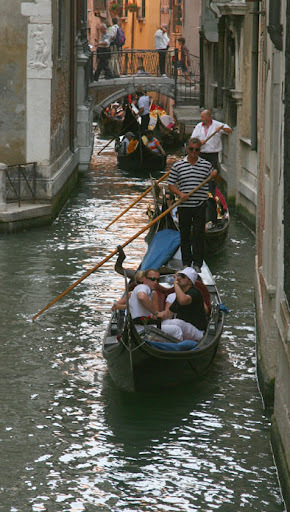 We loved so many aspects of this beautiful city and enjoyed every minute of our time there. 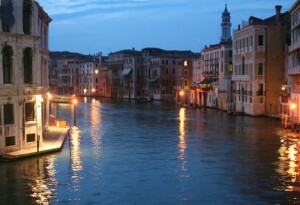 This entry was posted in Italy, Venice by bontaks. Bookmark the permalink.